The Promise and Perils of Clinical Trials by Alex O’Meara, a freelance journalist. Alex O’Meara researched and wrote this book after he participated in a risky and ground breaking type-1 diabetes clinical trial. In this book, Alex reveals what every health-conscious person needs to know about how drugs, devices and procedures are tested and approved. In 2004, Alex signed up to take part in a clinical trial (The Pancreas Islet Cell Transplant Study) involving an experimental transplant to cure diabetes. He had been suffering from type 1 diabetes for almost 30 years and had “hypoglycemic unawareness”, a condition where his blood sugar, instead of staying chronically high, would plunge dangerously low which can cause seizures, coma, and in some cases even death. The experimental procedure which Alex took part, replaces the insulin-producing cells that have died in a diabetic’s pancreas with living, healthy, insulin-producing cells. Because the cells are located in a part of the pancreas called the Isle of Langerhans, the cells are called islet cells. Those islet cells are taken, or harvested, from a recently deceased organ donor and infused through a tube into a person’s portal vein, which leads to the liver. The idea was that once in the liver, the islet cells would nestle in and produce insulin as if they were in a pancreas. After stringent interviews and tests, Alex was accepted into the experimental procedure at the University of Virginia. Later he found out that he was the only one “selected” at the UVA. This made him realise that he was merely “a test subject, the monkey in the space capsule”. The transplant was really experimental and he had donated his body to science and he wasn’t even dead as yet (page 17). a) Clinical trials are conducted to collect data only…however some clinical trials candidates suffering from cancer, diabetes, asthma, and other life-threatening conditions sincerely believe (or led to believe) that clinical trials are a valid medical treatment option (page 49). b) Subjects often come into clinical research studies believing that their own interests will be met in the same way as if they were receiving ordinary medical treatment (page 49). c) Terrible things happen in clinical trials because they are the most dangerous part of medical discovery. 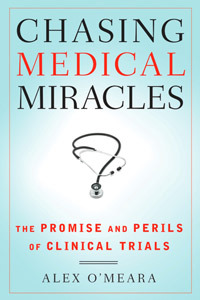 Very little in medical research, of which clinical trials are only the final phase, goes according to plan (page 21). d) Clinical trials are the one part of medical discovery where human lives are put directly at risk… in the absence of guidelines and agreed-upon definitions of what is ethical and not ethical, subjects in clinical trials get trampled in the blind pursuit of trying to apply medical breakthrough (page 23). e) There have also been concerns about whether the FDA allows pharmaceutical companies too much freedom in how they design trials and how they report the results of these trials. Pharmaceutical studies can be designed to falsely increase the likelihood of getting the results the drug companies wants (page 46). f) ….drug companies may skew the design of clinical trials so their drugs will come out looking more effective or less dangerous than they are. Among the tricks that can be used are testing the drug in a healthier population that will be taking the drug and comparing the new medication to a lower dose of an existing medication so the results look better for the drug being tested (page 75). g) ….consent forms that the trial subjects signed always overstate the benefits and the risks of the trial are understated (page 88). h) Because clinical trials are not therapy, because they are by definition research, terminally ill patients who do consent to participate in trials are usually persuaded to do so because of therapeutic misconception or the implication they will receive treatment in the trial (page 90). Regardless, clinical trials are not designed to provide patients with quality care. Somehow, patient care became part of a process designed to only gather information. The doctor administering the trial might be wearing a stethoscope and a lab coat, but he/she is not there to cure anyone. He/she is there purely to collect information from a subject and learn more about medicine (page 30). The history of clinical trials shows great swings between significantly helping and dramatically harming people (page 52). They are, after all “medical experiments” dismissed in the public consciousness as “a fringe medical endeavour along the lines of “Frankenstein cooking up a monster in a lab” (page 3). So, for cancer patients opting/signing up for clinical trials, remember it is an information gathering exercise only and not a medical treatment at all. And in some trials, a placebo (sugar pill) may be used. If you are a cancer patient, you do not have the luxury of time for some drug companies to experiment with your body. Only the drug companies will benefit…..after you are long gone. Alex’s experiment was not successful. In May 2007, one year after the transplant took place he had to increase his insulin intake and in 2008, he was an insulin-dependent diabetic again. His wife, who could not bear it anymore, filed for divorce. Subsequently, the drug company sponsoring the trials also terminated the protocol….and Alex O’ Meara was back to square one. There are a lot of books/references if you have the interest/inclination to read further on the subject of ethics (or lack of it) in clinical research. Below is just a short list. 1) HE BODY HUNTERS by journalist Sonia Shah. In the book, she shares that: The main business of clinical research is not enhancing or saving lives but acquiring stuff: data. It is an industry, not a social service.The people who sponsor and direct clinical trials do it for the data, not to please patients or help bolster ailing health facilities, although they may point to these side effects to justify their activities. 2. WHITE COAT, BLACK HAT: ADVENTURES ON THE DARK SIDE OF MEDICINE (2010) by Dr Carl Elliott, MD, PhD, Professor in the Center for Bioethics at the University of Minnesota, who says medical trials that were once carried out by medical schools and teaching hospitals have moved to the private sector and drug companies manipulate the research and review boards to get the results they want. After drugs are released they again manipulate the system to get drugs recognized on the market even if the risk to patients outweighs the benefits. 3. EXPLOITATION AND DEVELOPING COUNTRIES: THE ETHICS OF CLINICAL RESEARCH by Jennifer S. Hawkins (Editor), and Ezekiel J. Emanuel (Editor). The book is an attempt by philosophers and bioethicists to reflect on the meaning of exploitation, to ask whether and when clinical research in developing countries counts as exploitative, and to consider what can be done to minimize the possibility of exploitation in such circumstances. A case in point is clinical research sponsored by developed countries and carried out in developing countries, with participants who are poor and sick, and lack education. Such individuals seem vulnerable to abuse. But does this, by itself, make such research exploitative? 4. RETHINKING THE ETHICS OF CLINICAL RESEARCH: WIDENING THE LENS by Alan Wertheimer, Senior Research Scholar, Department of Bioethics, The National Institutes of Health, and Professor Emeritus, University of Vermont. 5. WATCH THE MOVIE….The Constant Gardener, a 2005 drama thriller film directed by Fernando Meirelles. The screenplay by Jeffrey Caine is based on the John le Carré’s novel of the same name. The film follows Justin Quayle, a British diplomat in Kenya, as he tries to solve the murder of his wife Tessa, an Amnesty activist. The story is told using many flashbacks and it is gradually revealed that Tessa was trying to uncover dubious drug tests by a Swiss-Canadian drug company on the local population. It was filmed on location in Loiyangalani and the slums of Kibera, a section of Nairobi, Kenya. Circumstances in the area affected the cast and crew to the extent that they set up the Constant Gardener Trust in order to provide basic education for these villages. The plot was based on a real-life case in Kano, Nigeria in which a meningitis drug, approved for use on adults were used on children (in Europe, the same drug was never approved for adults or children). This entry was posted in Book & Research Report by CA Care. Bookmark the permalink.